It is always best to call us to book a table especially at weekends and public holidays. Click on the drawn map to see a close up of the lanes close to us to help you find us. Initially follow signs for Leeds Castle and then for Harrietsham, Lenham, Charing and Ashford along the A20. At Charing, turn right at The Queens Head to Pluckley and Charing Station. 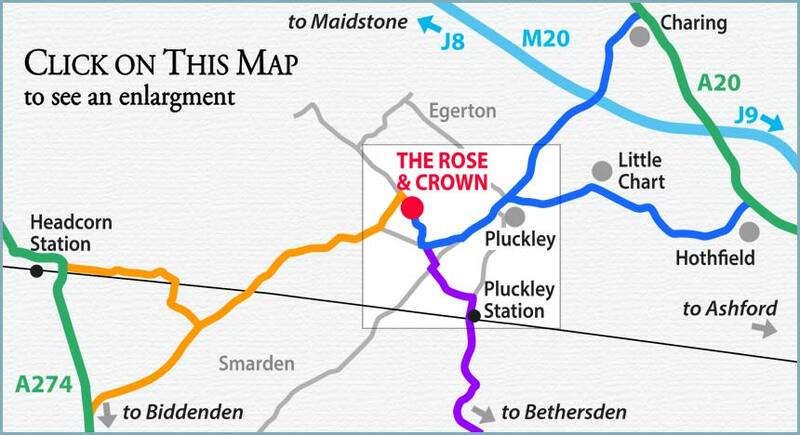 Continue to Pluckley village and pick up the route below. Take the A20 to Maidstone and turn left to Hothfield and Little Chart. At the end of the lane, turn left into Pluckley. At Blacksmiths Arms, turn right to Headcorn and Biddenden (A274) on Smarden Bell Road. Pass a left turn to Bethersden and Smarden (Rose Farm Road) and take the next right, Mundy Bois Road. We are half a mile down on the left. Head for Biddenden on the A274. As you leave Headcorn, take a left fork to Smarden and Egerton. At the end of the lane, turn left and pick up the route below towards Pluckley. Travel north towards Headcorn. Pass a group of three oast houses on the right and take the next right to Pluckley and Charing. After about 4 miles at the end of Dering Woods turn left to Egerton. Continue down the lane and turn right at the end. We are on the right a little down the lane. Turn off the A28 signposted to Pluckley along Forge Hill. Take the first right, Mill Road, and turn left at the end. Follow the road until you get to Pluckley Station, marked by a very narrow humpback bridge, then follow the route below. Heading towards Pluckley, take the first left, Chambers Green Road. Turn right at the end at Pluckley Farm Shop and then first left into Rose Farm Road. At the end, turn left and first right into Mundy Bois Road. We are half a mile down on the left. © 2016 Bennie Jane Cross.